Ragbag posts are what happen when you haven't posted anything for ages and you have lots of different things to blog about. Back to Ocean Grove celebrations to mark 50 years since the Proclamation of the Township. I remember pushing my decorated pram in the parade next to my brother's decorated tricycle. Apparently we both won prizes for some art works as well, according to contemporary accounts in the local paper. I did get to the dinner that evening held in the OG Bowling Club where I had spent so many lunchtimes with my father in recent years. The Dinner was delicious against all expectations and we had a good time. Having my brother on board helped us to come second in the history of OG Trivia quiz. (Who else would know the absolutely exact location of the OG railway station?) There were at least 4 other members of my Primary school class there and we were just able to recognize each other! Sunday morning spent going through all the family photos, newspaper clippings and other treasures with my cousin Ann who is the Menzies family historian. We found things that neither we nor she had seen before so it was quite productive. Our day off Tuesday was spent taking Tony's mum out for lunch for her birthday. She has recently moved from her unit in the retirement village into a serviced apartment in the same location. It seems a very pleasant place to be and she still has access to the old Casey family home as the community centre at Edrington Park. Caught up with friends on the Monday evening as they have been down for the "long" weekend of Cup Day. Melbourne Cup Day saw us lunching with friends in Melbourne. Pepper came too and enjoyed her day with 2 pugs, Millie the black one and Oki the other one and Gemma, their "cousin", a silky terrier Jack Russell cross. They all behaved in exemplory fashion although Pepper seems to get bored with other dogs after a while. She ended up snoozing on the mat in the doorway and watching proceedings from there. A photo at last - Ann's grandson Freddie finally got his jacket and it still fits him - and isn't he gorgeous in it!!! Inspiration strikes in strange ways. 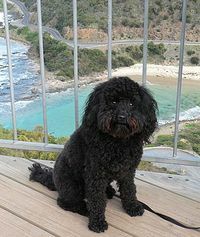 We were casting our minds around for ways to increase the foot traffic to our business in Geelong and right under our noses was the cutest pooch in history. We have decided to add a section to the Garden Gallery called Poochy. 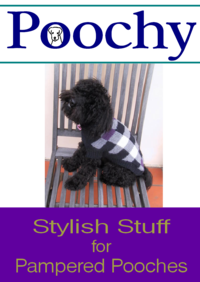 It will stock a small collection of exclusive items for dogs, hand selected by yours truly and promoted by the cute hound. To give you an idea of what I mean!! There will also be a line of hand made Gourmet dog treats from the kitchens of my friend E and I. This was E's idea and she has had loads of fun devising different flavours, toppings and shapes. I have been researching packaging and the promotional side of the venture. I've finally got around to waited 'til the New Year to post some great photos of Pepper enjoying her holiday in Noosa last year. We walked along the river most days so she could have a run off lead. Once she sees a ball she is so focussed on it that even other friendly dogs don't get a look in, she just growls at them and prances round the ball thrower. Sometimes we have to have 2 balls at a time because she is not that great at dropping the ball. When there are 2 you just threaten to throw the second and she drops the first immediately. These shots taken by greg with his newish crash- hot camera show just how fast (and cute) she really can be. I have to record a grave misdemeanor. Today I decided to treat myself to a gourmet sandwich for lunch. I "buttered" the bread with cream cheese and layered it with slices of succulent smoked salmon. Lemon juice, dill and capers finished it off nicely. Plated sandwich and took it to the table, sat down and turned to the front page of the newspaper. Before I could take the first bite Elizabeth arrived and I went outside with Pepper to greet her and discuss what we were going to do with the garden this week. I wandered back inside and went to the table - nothing on the plate. Feeling confused now, I wondered if I could indeed eat without noticing it. Felt sure I would have remembered such a yummy sanger for more than a few moments, then noticed 3 small slightly chewed capers on the rug under the table. No crumbs, just capers! My chair had been left out from the table and I soon deduced the culprit, now looking very self satisfied, but without a crumb on her whiskers. The gourmet dog had struck again, reinforcing my long held view that poodles have highly sophisticated taste buds and go for the best food available. Our previous poodle - Nimh was an expert at detecting chicken breasts (no other cut) or fillet steak at 50 paces, but she was so small that she never had a chance to scoff them. We no longer eat fillet steak but I have my suspicions that Pepper's radar would detect the difference! To add insult to injury I had already given her a yummy dog biscuit because I felt sorry for her not having such a delicious lunch as I was about to eat. Pepper has just had her second ever haircut. This time in a mobile dog wash van at our door. She seems to have behaved herself reasonably well, but has reappeared as a slimmed down Girly poodly puppy. It is always something of a shock seeing her new look, but I guess we'll get used to it and it does grow back! !